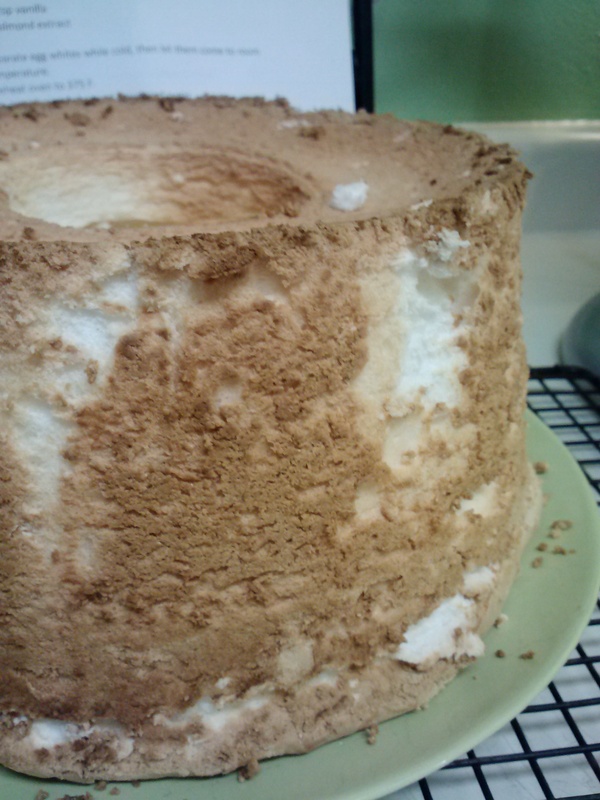 One of my favorite cakes that is popular this time of year is the Angel Food cake. Light, fluffy and sweet, angel food cake is great when paired with strawberries, topped with chocolate, mixed into a trifle, or eaten simply by itself. The best way to eat it is with a cream cheese and strawberry mixture. I love it! Despite how much I adore angel food cake, it's one that I don't make as often because of the intense time commitment and patience that it takes to make it. 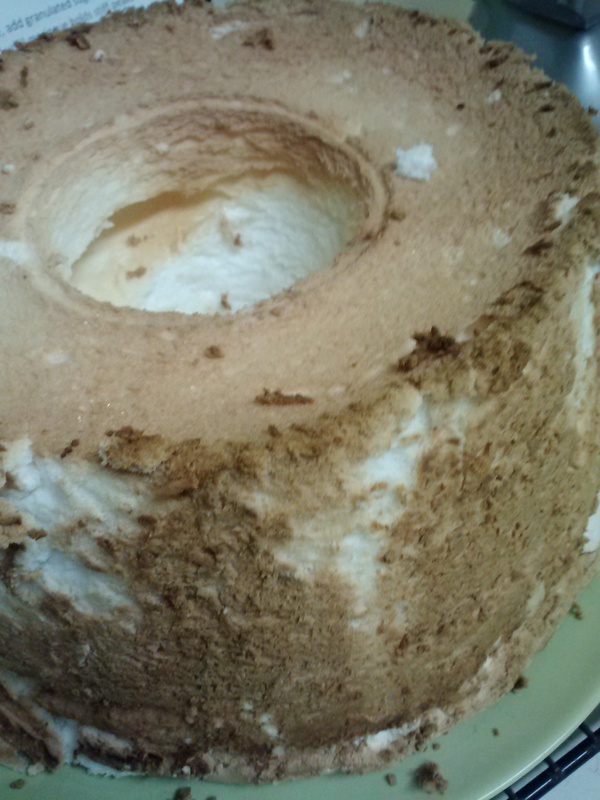 Making an angel food cake is an art, one that in this day of cake from a box has been neglected by many people. I'm very grateful to have been taught how to make my favorite cake! When I switched to gluten free, angel food cake was actually one of the first cakes that I was able to make without wheat flour. Because of the low flour to everything else ratio, it is fairly easy to substitute gluten free starches and flours instead of the normal all-purpose flour. I was overjoyed when I could eat something I enjoyed and it tasted great! 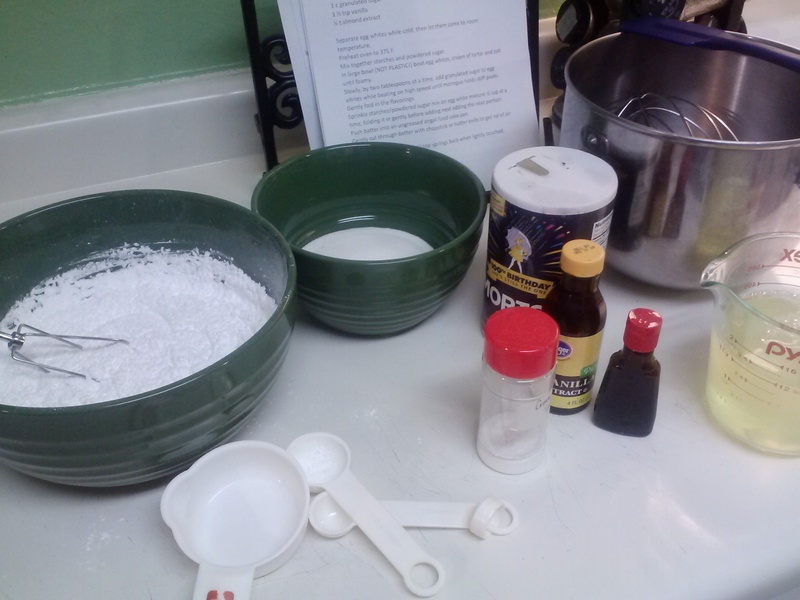 As you make angel food cake, I have a few tips for you! First: make sure you use metal or glass bowls, not plastic. In addition to that, make sure the bowls are VERY clean. 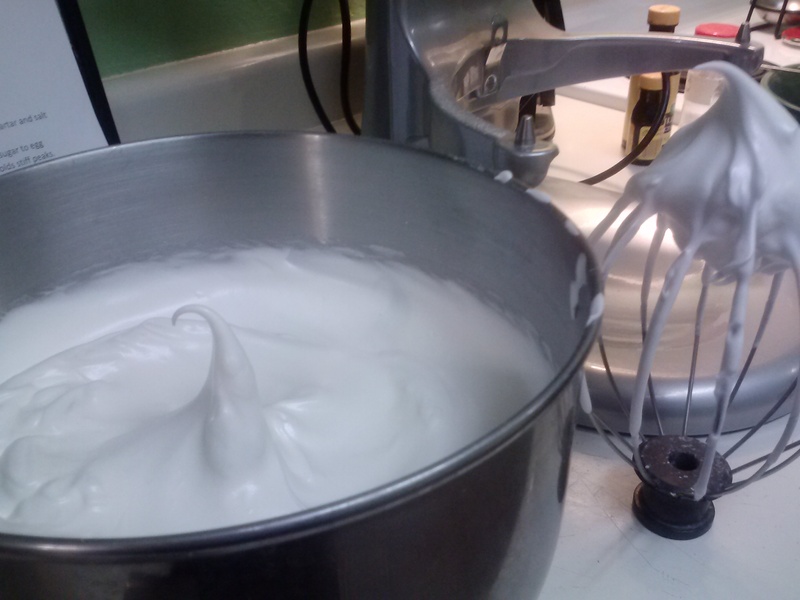 Any grime or something left over from another project will make your egg whites not whip up into nice stiff peaks. Separate your eggs when they are cold, but whip them when they are room temperature. I didn't wait this last time as long as I should have, and the egg whites took a long time to beat into the stiff peaks I needed for my cake. Wait and be patient; it's worth it. Speaking of waiting, this will take lots of time and lots of patience to make this cake. This is not a fast cake, not a mix you can whip up in 3 minutes and be done. 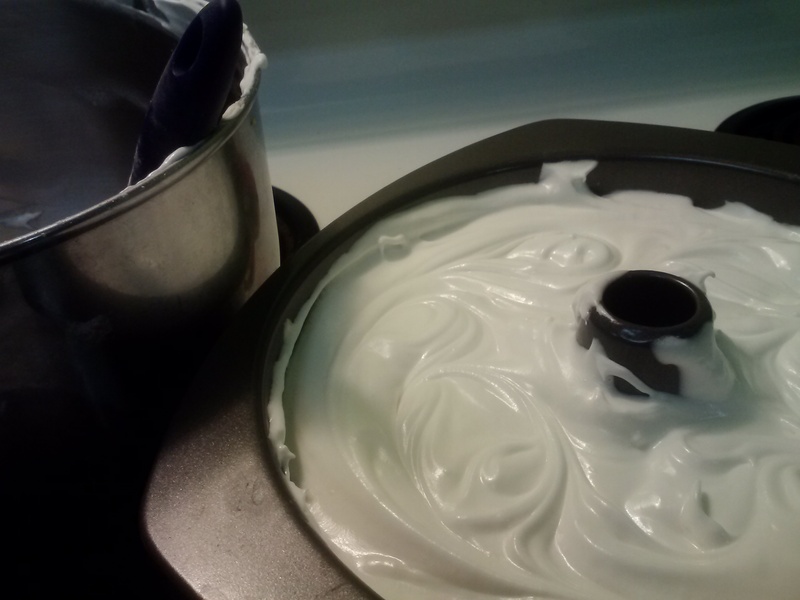 I easily spent an hour, between separating egg whites until putting it into the oven. I love this cake, but it takes a good chunk of time to make. Know that going into it, so you don't have to cut it short unfinished. This cake does go faster if you have everything prepared, pre-measured and ready to go before you start mixing. First, I separate the eggs, then I set everything up for the rest of the cake while the egg whites are coming to room temperature. I like to have everything ready, several bowls laid out and ready to add as I need them. In order to guarantee your cake is truly gluten free, double check your extracts. Use pure extracts, not imitation, and look for brands clearly marked as gluten free. Make sure you aren't cross-contaminating your cake by having clean bowls, mixers, counters, and everything! In order to keep track of how much sugar I have added while beating the egg whites, I pour the entire amount into a small bowl, and then measure from that until it is gone. That way I never forget how much sugar I have added! I just add until it is gone. While it's a lot of work, the cake is totally worth it! Enjoy!